This mini-course is the Untapped Gold Mine Of PMP Certification queries that Virtually No One Answers, NOT EVEN Google. If you want to get PMP certified and still confused How To Turn PMP journey Into Success in the first go, this is a must-have course for you. This short 7 hours course clears some lies and misconceptions about the PMP. The Project Management Professional or PMP is the most popular and globally reputed professional Certification which requires a good amount of preparation and planning, If you get started on a wrong foot, you may end up losing motivation to complete your study. Get introduced to the world of project management with our free introductory PMP program by Saket Bansal. Understand the various knowledge areas and process groups covered under PMP, PMBOK structure, Application process. Here is what you can expect to learn after going through this course. Actionable plan to get better at PMP Preparation. How to get PMP Certification without getting stuck on the journey. Have you often heard this phrase among your peers “PMOBOK6” is hard to decipher? Saket makes it a breeze and this course is the best way to start decoding the complex knowledge areas and process groups of PMI domain. You will get answers to most of your queries related to PMP and PMI certification process which google can’t answer. Go ahead and clear your confusions before you decide to go for PMP. To join, simply click on the enroll button and you will be taken to the eLearning portal of iZenbridge. Create your account and start learning. 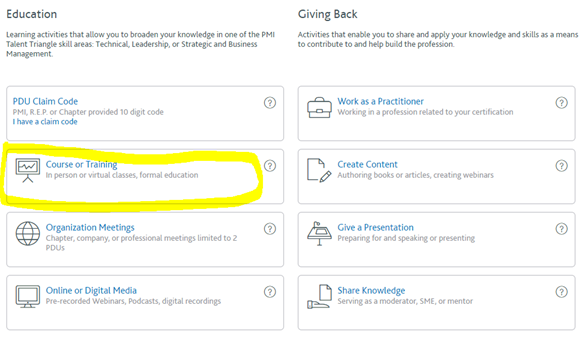 How to Claim PDUs from this free course? You need to provide the course name which is available in PDU claim section of your PMP® Free introductory course. As soon as you will fill the name of course (second column of the screen), the other details like course provider, course description, and PDU details will be available from the PMI system automatically. You don’t need to enter these details manually. Fill other details of Date Started and Date Completed. What is the breakup according to Talent Triangle? Can I use PDUs while filling the PMI Application? It’s often a misconception among students who are just getting started with PMP certification. PDUs and Contact Hours are two different concepts. To be eligible for PMI Certification Exam, you will have to earn Contact hours (For that you need to complete our PMP Online Program). The Professional Development Units or PDUs are useful for professionals who are already PMI Certified.